Stakeholders in the timber industry have described as absolutely true the acting sector Minister's official assertion that the draconian seven per cent National Reconstruction Levy imposed on wood export earning is largely responsible for the virtual collapse of the industry. “The assertion made by Prof. Fobih, Lands, Forestry and Mines Minister-designate when he appeared before the Appointment Vetting Committee of Parliament on Monday encapsulates the whole truth about the dwindling fortunes of the timber sector,” they stated. A joint survey sampling in Kumasi by journalists in Kumasi praised the Professor for being bold in disclosing the truth. Over the past four years, the timber industry led by the Ghana Timber Millers Organisation has persistently criticised government's imposition of the seven per cent reconstruction levy on gross earnings from wood exports. It argued that the levy is eating up the turnover of the saw millers leaving them little or virtually nothing at all for re-investment and expansion to facilitate value-addition or downstream processing for export. 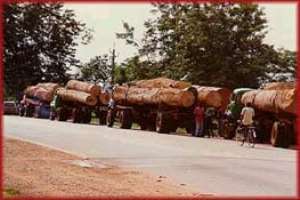 The industry which thrives on timber, a renewable resource and for that matter the land, has been tagged with seven per cent and the gross export earnings while the mining sector which also depends on the land resource with its attendant environmental problem is paying a meagre 2.5 per cent levy not on its gross earnings but the net proceeds.